Having a backyard wedding comes with its pros and cons. Not only is it more intimate, but — and this is likely the biggest draw — it also allows you to save some serious money. On the flip side, however, you’re building the wedding from the ground up, and suddenly you find yourself asking a million questions: How many tables do I need? Do I need a professional to come out here to manicure my lawn? Where do I even start with creating the ceremony backdrop?! Take a breath, though. 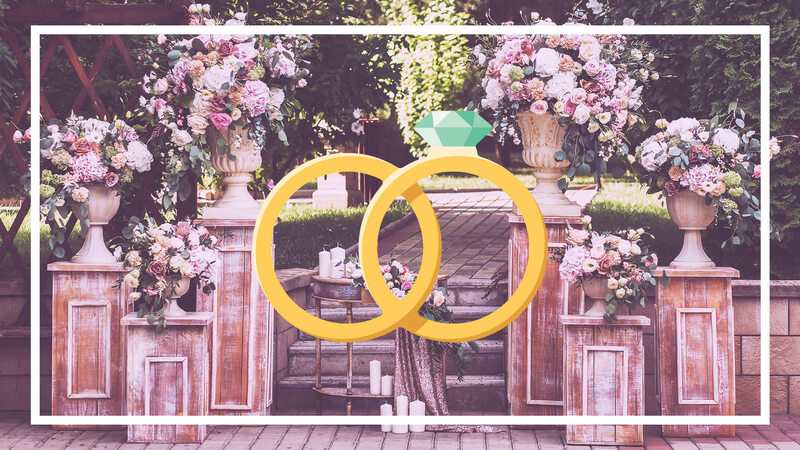 Yes, it’s a lot to take in and a lot to figure out, but with a few tips in mind (and a well-organized Pinterest board to reference frequently), throwing a backyard wedding can be done. And make it as dramatic as you’d like. Your guests are arriving at a wedding — your special day — after all, so it should feel like they’re stepping into an event they’ll never forget. “It can be as simple as a balloon arch or as fancy as a cascading balloon garland,” says Andrea Rosewall, an interior designer in Glendale, Arizona. By no means do you need a photo booth, but it’s more fun if you do. If you do ditch it altogether, you’ll still want some sort of background your guests can take their own photos in front of. This isn’t any ordinary backyard party, so don’t treat it as one. Think bigger! During your wedding planning, it’s easy to forget one part of it — likely because you’ll be so busy getting ready: the pre-ceremony. While guests are arriving and waiting for the ceremony to begin, be sure to have an area where they can mingle — and maybe even grab a small bite or beverage. That’s not all. Think about where the ceremony will take place and where guests can let loose after dinner. That said, you’ll want to elevate the officiant, bride and groom, and ensure you have speakers set up — it won’t be quite as impactful if you can’t see or hear what’s happening. “Take them on a journey,” Rosewall says. Popular options include using candles, string lights and flower petals. Your grass needs to look its very best. Like Rosewall said earlier — the special occasion will get photographed by everyone. We’re talking about toilet paper here, folks. Keep plenty of it on hand, and keep all garbage out of sight. Lastly, don’t hide the pool — make it part of the wedding.